Six days to go! 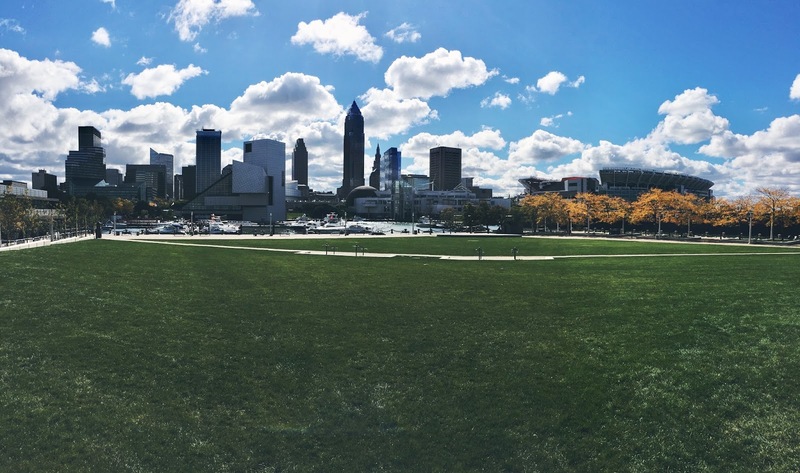 Since this is Cleveland week on my blog, I figured I'd throw it back to 2013 and start listing off my favorite Cleveland memories. These are in no particular order and might not be totally chronological because I'm actually incapable of keeping track of time. 1. Finding out the the Starbucks on East 14th has a second level. That's right, during my first week of school, my mom and brother came up for the long weekend because I didn't want to spend it alone because I was SEVENTEEN AND SCARED. We went to get breakfast and wandered into the Starbucks only a few blocks away from campus and I looked up and saw the second level that looks over the entire store. I ended up spending almost every single Sunday sitting up there my freshmen year, reading, writing, studying, but mostly people watching. 2. My first time wandering down East 9th. During my first month or so in Cleveland freshmen year, I'd only walk up and down Euclid Avenue and wouldn't wander anywhere else. One time, I was on the phone with my mom and I asked if it was safe to walk down East 9th. She sort of laughed and assured me I'd be fine. So, I wandered down towards the water and discovered the pier. I felt like I struck gold. I used to have a Sunday ritual, actually. I didn't have friends (just saying this to be truthful), so when I was bored on the weekend with no schoolwork, I'd get up, go to Starbucks, walk down to the pier and would just sit and read for a while. When I got bored or too cold sitting in the wind, I'd walk back down East 9th and would head to Panini's. There, I'd get a slice of pizza, an order of fries, and a diet coke. Then I'd, you guess it, read or write some more. I miss doing that from time to time. It was my "me time" and helped make me feel more comfortable where I was living. 3. Getting dressed up in our old prom dresses with my roommate and stealing food from a campus event. I mean, it wasn't really stealing. They were having a ball in our dorm, so my roommate and I decided to get dressed up and check it out. Except it was boring and nobody was there...so we just took entire plates full of dessert and booked it back up to our room. Then, still dressed in our prom dresses, forced our other roommate out of her room and we all walked down the street to get milkshakes and french fries from Burgers 2 Beer. 4. Starting this blog. I technically had this blog since summer of 2012, but I created Life According to Francesca during March of my freshmen year and it's been, hands down, one of my favorite parts about Cleveland, even if it didn't directly come from the city. I've never been more grateful for a decision in my life as much as I've been for deciding to start blogging daily. 5. Seeing Andrew McMahon live at the House of Blues. My Spanish class that evening had gotten cut short, like two hours short. My friend in the class and I were chatting afterwards and somehow the topic that Andrew McMahon was going to be right down the street at the HOB came up and I was like "I LOVE ANDREW SO MUCH" and he said the same thing. So, basically, we both decided that since class got canceled, essentially, we'd meet back up at HOB in a couple of hours and would see the show together since nobody else wanted to go with us. It still is one of the best concerts I've ever seen, hands down, and one of the most impulsive things I've done as well. Thank you, professor, for canceling class early! 6. Getting my job at Wandering Wardrobe. I didn't have a job in Cleveland and wasn't quite sure how I was going to get one with my weird school schedule. I would have to drive out to the suburbs to get to any malls and I didn't want to work in food service. My friend at the time found out about this new boutique downtown because she had interviewed the owner, Caroline, for a class article. Caroline and I talked a bit through e-mail. After meeting once after the new year, I waited a few more weeks before I stopped by for what I thought was going to be a formal interview. Instead, she spent twenty minutes showing me how the register worked, a few things to do in the lines of steaming and tagging/pricing, and tossed me a set of keys and asked me to close up. I stood there, stunned, that she trusted me from the start. Ever since that really cold February day where she left me to the man the store by myself (which I'm not even mad about, I just think it's really funny that here I thought I was just getting interviewed when in reality I'd already been hired), I've loved saying that I work in a box, or now, a truck. It was my first job in Cleveland, my friend clothing retail job, and just one of the most fun jobs I've ever had (and probably ever will have). 7. Moving into my first apartment. I don't even know where to start with this one, or even if I can say anything about it. I've been here for two years now and honestly, I love it. Sure, the area isn't the best and it gets really cold in the winter, but these lofts are just such a good place for anybody to live, let alone a twenty something college student. It was also the first time I could really be self-sufficient, paying my rent and utilities out of pocket, even if it made me cry loads because I didn't know how to budget my money for groceries, gas and other necessities. 8. Getting my job at Cleveland Consignment Shoppe. I can't talk about this part without crying, so I'm not going to go into much detail. I started as just a Saturday worker who would come in a couple of times during the week to work on e-mails and Instagram/Facebook. I don't even know how I got to where I am where going to work feels like fun and "family time" rather than just a retail job. I babysit my co-worker's kids, I dogsit for them. It's not just a store, it's so much more, and I'm so grateful for the opportunity to work there and cannot believe I got #blessed with the best job in the world that I'm so not ready to leave this week. 9. Seeing Kodaline and interview Mark Prendergast. I've already blogged about this, but this was for the newspaper that I used to work for on campus. I took a chance and set up this interview and arranged for concert and photo passes with their manager. It was so out of my comfort zone, but Mark (the guitarist) was so sweet and let me ramble on for about thirty minutes before showtime. 10. Going to my first ever fashion show. Every year, local designer Valerie Mayen (who was on Project Runway) puts on this fashion event called Hullabaloo. I covered it for a class project and had the most spectacular time just experiencing live fashion for the first time. 11. My 20th birthday. Two of my roommates took my friend and me out to dinner for our birthdays and we just had such a spectacular time. Then we came back and got up to some shenanigans with our friends at their apartment and then it was the first snow of the year, so we went outside and played in the slush and I just remember it being one of the best nights ever. In retrospect, that sounds really lame, but it really was. 12. Every single Indians and Cavaliers game I've ever been to. Not really all that pleased with that one time I went to a Browns game freshmen year and left at halftime because I had no idea what was going on. 13. Every single time I've gotten blessed with Barrio. If you're ever in Cleveland, GO. GOOGLE THE LOCATIONS AND GO. 14. My 21st surprise brunch party. It was technically the day before my 21st birthday, but my roommates organized a surprise brunch party with all of our friends and it's something I'll cherish forever. I don't even care if I sound so lame right now, it was super sweet, super fun, and involved a mimosa bar. Come on, you'd cherish this memory too! 15. My graduation. I feel like this stands for itself. Everything since December has been a blur of work, fun times with friends, and everything in between. I cannot believe it's all coming to an end this week, but I'm trying not to be sad about it.